Hosting a Unicorn Birthday Party? Swoon over these whimsical Unicorn Party Favors. They are not only easy but adorable and cute for any unicorn lover! 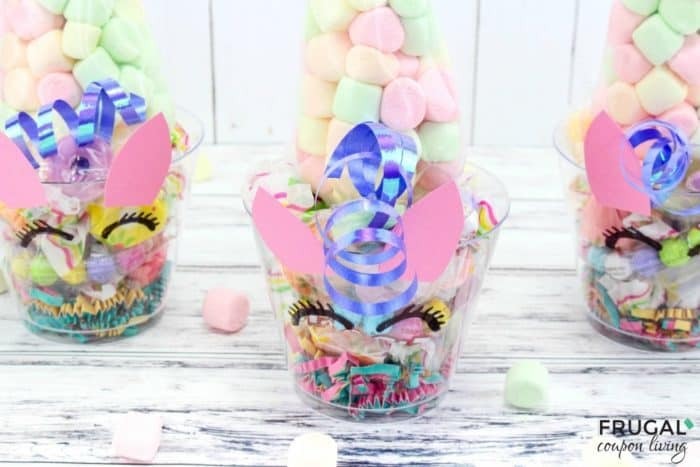 We were helping a friend come up with some ideas for her unicorn themed party and had to share with you this party favor idea. 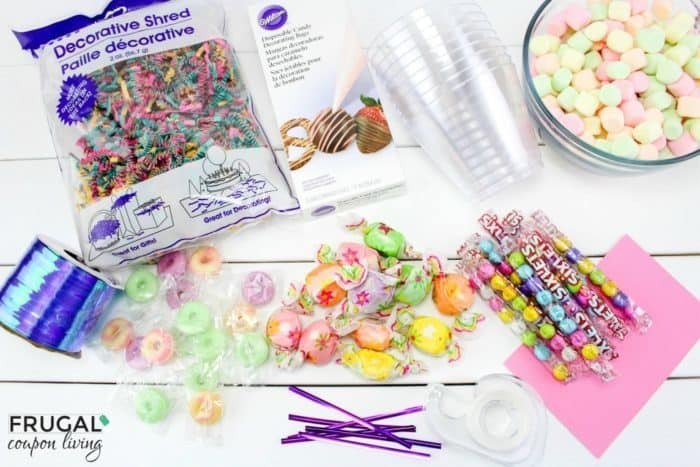 You can have the kids make it at the party for a fun little craft during the celebration or you can pre-make them ahead and send them home as party favors with the kids! They really are fun to make and require only a little assistance from adults! 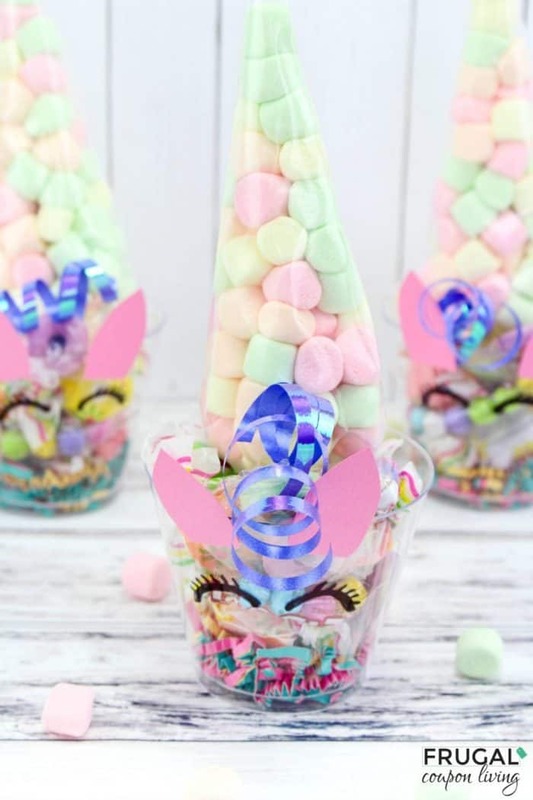 We pre-bought candy, but another fun idea is to pick up a unicorn pinata and when children collect the candy from the pinata they can make this fun unicorn treat! I think Salt Water Taffy would be a fun, light colored candy for the unicorn! Fill each clear piping bag with marshmallows about halfway up. Tie them closed with the bag ties and cut off the top of each bag above the ties. These are the unicorn horns. Use the pink paper, and cut out 8 little pink ears, about 2 inches tall. Cut 8 pieces of the curling ribbon, 6 inches long. Tape the ends of 2 ribbons together to a piece of candy. Curl the ribbons with scissors. Put a little confetti into each cup and put a unicorn horn in them with the points of the bags pointed up. 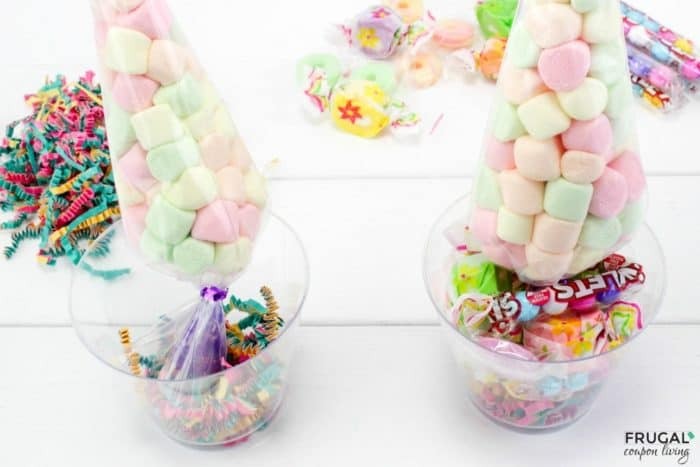 Hold onto the horns so they stay up straight while you fill the cups with candy. This will hold the horns up. Tape 2 little pink ears on the fronts of each cup at the top and draw 2 eyes under each ear. 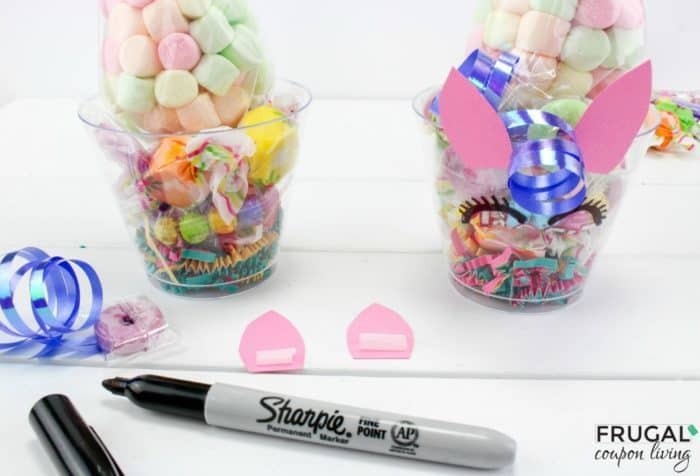 Place the candy with the taped-on curling ribbons right on top of the cup in front of the horn. Have the curling ribbon hang down right between the ears, so it looks like a horse’s mane hanging down. These cute unicorns would be fun at any party! 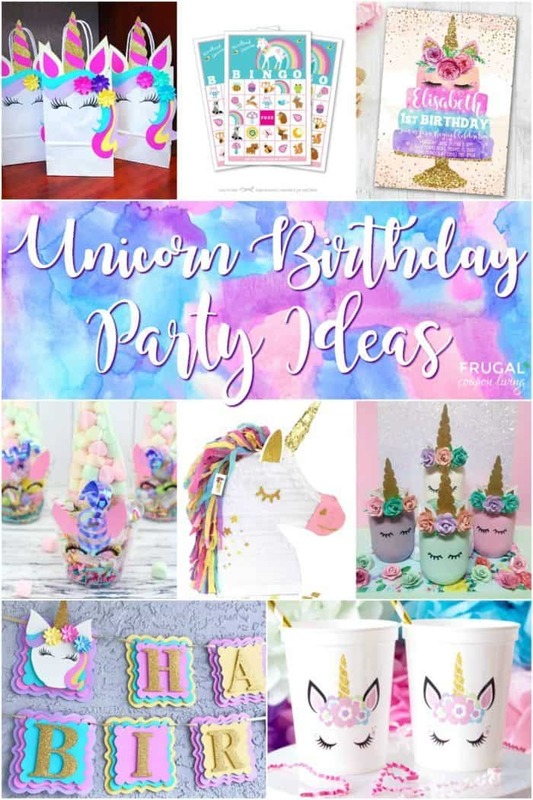 Of course, if you have party favors for a unicorn party, you need Unicorn Birthday Party Ideas! We gathered up some of our favorite ideas to top off your party decor and celebration! Take a look at these ideas! Display a cute Unicorn Happy Birthday Banner! 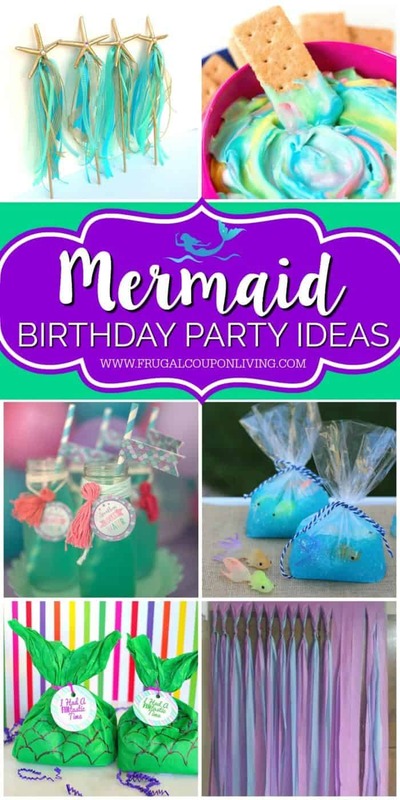 Take a look at these Mermaid Party Ideas. Pin to Pinterest. 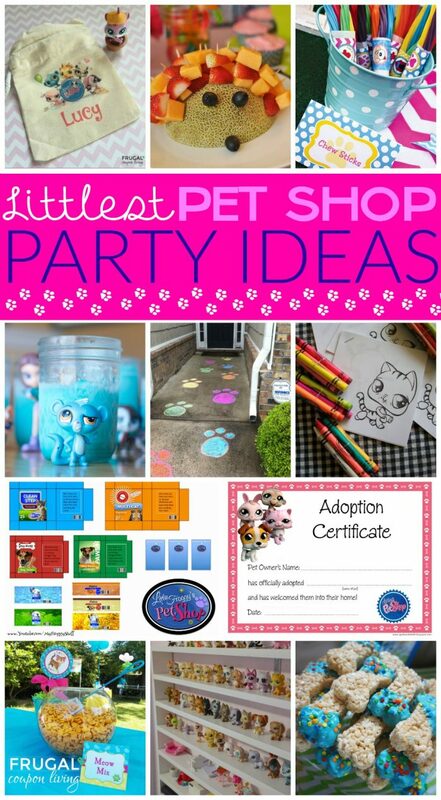 We also think you will enjoy these Little Pet Shop Party Ideas. Pin to Pinterest. 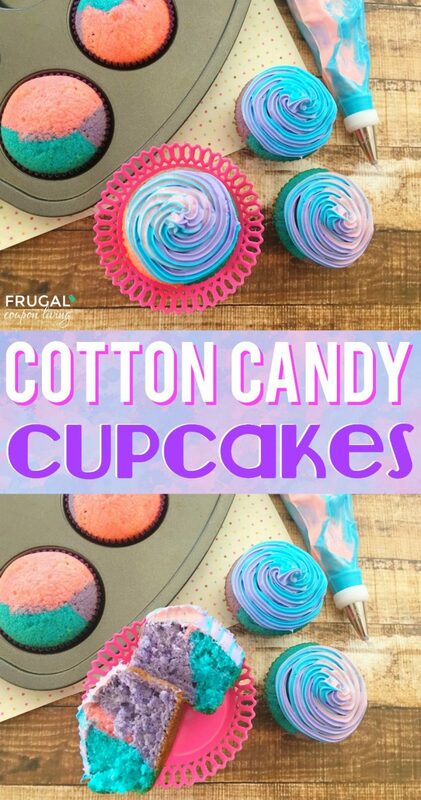 It could be fun to serve our Cotton Candy Cupcakes! Pin to Pinterest.